Tea Party Member should be voted Out. It's time. It's time to vote out the Tea party and elect Democrats who will follow the will of the people. It is ridiculous that this country has allowed a group of self centered congressmen and women that were elected by doctored and tailored made districting in many obscure states to be elected to government office. Now the American people are paying for it, with these misguided people in office. The government shutdown is no joke and the Tea Party is to blame. Nick Foles did an admirable job today coming in for Mike Vick after Vick went down with an hamstring injury. 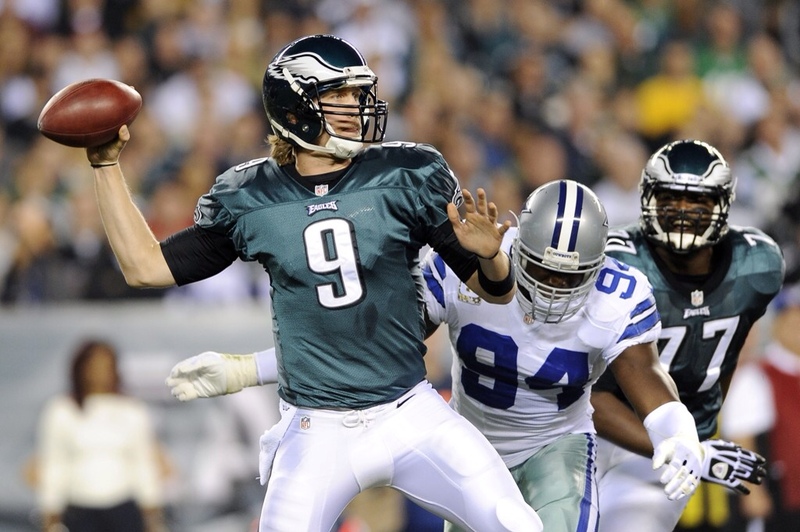 Foles threw two touchdown passes to lead the Eagles to a 36- 21 victory over the New York Giants. This was a must win victory for the Eagles and coupled with the Broncos victory over the Dallas Cowboys, the Eagles now find themselves possibly in first place in the woefully bad NFL East. For the Eagles it was a good day, with Mike Vick rushing for over 70 yards, and Foles leading the team to two touchdown in the second half. 1863	President Abraham Lincoln declared the last Thursday in November Thanksgiving Day. 1960	“The Andy Griffith Show” premiered on CBS. 1974	The Cleveland Indians hired Frank Robinson as major league baseball's first black manager. 1992	Barack Obama married Michelle Robinson at the Trinity United Church of Christ in Chicago. 1995	A jury found ex-football player O.J. Simpson innocent of murder in the 1994 slayings of his former wife, Nicole Brown Simpson, and Ronald Goldman. 2011	An Italian appeals court freed Amanda Knox of Seattle after four years in prison, tossing murder convictions against Knox and an ex-boyfriend in the stabbing of their British roommate. The Deal- The Lord’s Plan For You. It is becoming awfully hard not to go there, but I feel a need to go there. In regards to the government shutdown, I blame the Republicans. They are the culprits and if the economy takes a dive that reality is plain and simple. It is their fault ( make no mistake) it is the Republicans. Not only are they doing this because President Barack Obama is African American and they literally can't stand that. That is the reason, whether or not anyone wants to admit it or not. Sane people don't care what race President Obama is, but the handwritings on the wall and apparently Republicans aren't the least bit sane. Their hatred results in thousands of government workers not being able to feed their families. Their hatred causes millions of American's not to have access to vital services that they need. Their hatred would rather have people die of cancer or any other lethal disease if it mean't that they had to pay as little as one cent for treatment. They don't care who dies, so long as they can horde their own money and take kickbacks from the thousands of special interest groups that are linning their pockets. That is the reality. Anyone who would use race as a basis for their hatred is less than a Patriot. They are going around Hi Five-ing each other because they did a noble thing, stop President Obama and shut down the federal goverment. Sounds like in bred terrorist to me. This certainly is something they should not be proud of. They should be ashamed of themselves. They finally got Obama where it hurts they are probably thinking. In the long run they are hurting themselves and this country. Okay, I don’t follow Peyton Manning’s exploits, but I think we all got to give a shout out to the guy. Can’t say I know a lot about him, but I do know this is the only man who can literally control an entire football game and orchestrate the outcome. He’s like a conductor on the field. He can instantly read defenses and counter the play with audibles, some times multiple or triple audibles. His accuracy is unbelievable when he throws the ball. And he barely breaks a sweat when he’s on the field. Yesterday the guy had no third downs! No third downs. That’s just like playing a basketball game to 50 points and spotting the guy 40 points and still beating him. Oh did I mention that he probably averaged 8 to ten yards per possession yesterday in a 52-20 win over the Eagles? And he’s 38 eight years old playing with against and with players who who are possibly 12 to 15 years younger than him. To be blunt we are probably looking at the greatest quarterback in NFL history in Peyton Manning. A certain Hall of Famer!